Cafe Atlanta (CATL) is a FREE social activities group for OPEN MINDED and positive creatives (Artists, writers, cartoonists / illustrators, dancers, photographers, vocalists, designers, musicians, sculptors, actors, film / video professionals and so on.) and fun loving intellectuals in the local Atlanta area who are interested in networking, and socializing at local Book Stores, Museums, Cafes, Parks, Indie Film Theaters, Restaurants, Plays, Coffee Shops, Art Galleries, Festivals, Lectures, and other local .. The web server used by Cafeatlanta.org is located in Great Britain and run by EUKHOST Ltd. 27 other websites are located on this web server. Most of them are provided in the english language. Only a few websites on this web server are x-rated. 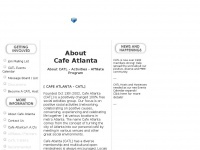 The websites of Cafeatlanta.org are served by a Apache server. The website does not specify details about the inclusion of its content in search engines. For this reason the content will be included by search engines.